When I make chili I often think about cornbread. This time I remembered reading about a cottage cheese cornbread that I had thought sounded really nice. I like cottage cheese but I don’t have it nearly often as I would like and this was a nice excuse to get some. I was thinking that the cottage cheese would add a really nice texture to the cornbread and help keep it nice and moist. Cornbread is a quick bread and thus pretty forgiving with tinkering with the recipe so I took a pretty basic corn bread recipe and added the cottage cheese and removed some of the oil or butter. I also added some corn as I enjoy the sweetness and texture that it provides. The cottage cheese cornbread turned out great! It was nice and moist and light and fluffy. Most of the cottage cheese melted into the cornbread but there were a few pockets that when warm were nice and gooey and stringy and good. The cottage cheese cornbread went really well with the spicy 7 chili chili . I had a lot of leftover cornbread and on a whim I decided to try some for breakfast. I placed it into the microwave for a minute or so to warm it up and then I topped it with some meting butter and maple syrup. 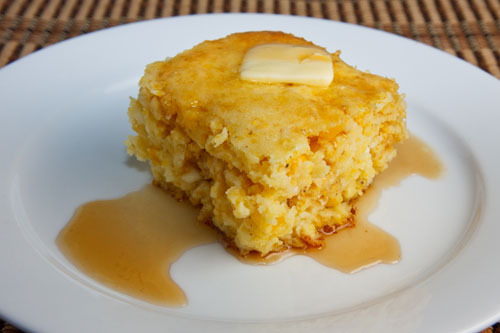 The breakfast version of the cottage cheese cornbread was amazing! It was like a super light and fluffy pancake that absorbed all of the maple syrup goodness. I will certainly be making this cottage cheese cornbread again for breakfast (or dinner) again! Mix the cornmeal, flour, baking powder and salt in a bowl. Mix the sugar, eggs, buttermilk, cottage cheese and oil in another bowl. Pour into a greased 8 inch square baking pan. We love corn bread, I just made some with honey last night to go with our refried bean chili. However I would have never thought of using cottage cheese…Very interesting Kevin. I would never in a million years think to put cottage cheese in my corn bread!!! Brillant! Wow, what a neat combo! Nice twist, I love cornbread! You are so clever Kevin, I love cottage cheese, what a great idea! How interesting, I bet it made a very moist bread. Buttermilk AND cottage cheese! I bet they were really moist and delicious. And with maple syrup? Heaven! I will have to try this! You need to try my sour cream cornbread, so moist its like cake. It is a favorite with everyone I know. Give it a try! Hmmm..colorful and yummy..toruture torture..I love cornbread too. You know what would make this even more delicious? But it still looks amazing! Looks great! Sometime you should try cornbread that is “baked” on the stove in a cast iron skillet, covered in foil. yum yum! cottage cheese is such a creative addition! well well well … a new take on cornbread .. I’m intrigued! This might be an interesting experiment – thks Kevin! This is just proof that everything is always better with cheese!! Seriously Kevin, I can imagine that the cottage cheese made this bread extra moist and delicious! I just love cottage cheese! Must be delicious!!! What a delicious combo ! I’ve made cottage cheese pancakes with great success, I can totally see how moist it would make this cornbread! I must try!! Wow…the cornbread looks delicious! Will have to try this! Sounds great and looks great. I believe the cornbread and chili go hand in hand. Can’t have one without the other! Had wonderful ribs and cole slaw for dinner last night, with cornbread — the indispensable part of that classic American trilogy! Don’t think I’ve ever heard of cottage cheese in cornbread, but why not? Will give it a try. I have some left over cottage cheese and I will definitely be trying this! Thank you. Your cornbread looks fantastic! The breakfast version with maple syrup sounds great too. Yum Kevin! I bet this corn bread is super moist too! WOW what a great twist. Never would have thought to put cottage cheese. Dear Kevin , this look absoletely wonderful and tasty!! xGloria yummy!!! My daughter says she loves cornbread and has been begging me to get/make some…so thank you. This version sounds terrific, especially the breakfast! Oh cottage cheese. I like it. Got here from Foodgawker. Love this recipe! Brilliant idea and I have to try it. Never thought of a cottage cheese cornbread. Interesting idea. Sure it was great with the chili! How interesting and a great idea of adding cottage cheese. Great idea to add cottage cheese. I love corn bread, so I’ll have to try this. I end up bookmarking tons of your recipes! I absolutely love your blog. You have the most amazing recipes. I love to cook and I’m very happy that I found you. I’ll be trying your cottage cheese corn bread in the next day or two. Thanks for the awesome cooking tips. What a great idea to add the cottage cheese! I have had so many cornbread recipes come out way too dry. darn, i just made cornbread the usual way! :o) i’ll be sure to keep your recipe so I can try this next time. I love corn and anything made with it! What a great idea to use cottage cheese! I’m going to try this next time. Wow, we’ve had many a cornbread–homemade and from a box–but never with cottage cheese. Must be very moist! I really like the idea of putting whole corn in the cornbread as well. And cornbread is so good for breakfast. I may have to give this recipe a try. I love the idea of cottage cheese in cornbread – very creative! Sounds like the perfect breakfast to me. Very Unique Kevin! Could have never thought of cottage cheese & corn! Not I am thinking some peppers might taste good with it too! I love cottage cheese and this is such a great way to add some protein to cornbread. I bet it would be good with maple syrup on it as well :P.
ooh, another great one, must try!! this looks SO good…i don’t think i’d have any left over for breakfast the next day, though! can’t wait to try it- i love cottage cheese, and it adds such a lovely lightness when you use it in baking. Wow! I wonder if I can just add cottage cheese to my Jiffy cornbread mix??? What a unique sounding recipe! Thanks for sharing! Pam: I saw some recipes online that called for adding cottage cheese to the Jiffy packages. I’ve been looking for a good cornbread recipe. This looks terrific! this sounds fantastic! i will have to remember the cottage cheese next time i make cornbread. This is a really good recipe. Thank you for sharing. The first time I made it I added some chedder as well. the second time that I made it I added some jarred Jalapenos. Thanks so much for this recipe, Kevin! I substituted the cottage cheese for a cube of havarti in each cornbread muffin (used a muffin pan and baked these for 15 mins) and I was nervous since havarti has way less moisture content than cottage cheese, but I loved the results! Wonderful recipe! Thanks so much!!! Deepster: The cube of havarti in the middle of cornbread muffins sounds good! This recipe was so, so yummy. The second time I made it, I followed the directions exactly and then added about 2 tbs of diced sweet-hot jalepenos and a cup of crumbled feta. Holy crap, it was delicious. Thank you! Delicious and moist. I used frozen roasted corn in this. This will be my go to corn bread recipe.